In Hyderabad, one of the least noticed UN organisations is busy. The CBD is the convention on biological diversity, and associates with the IUCN on Red Book and similar areas. Its learned members sort out all the wheat from very little chaff these days. The primates are probably important to us for more reasons than we know. As we have removed most of their habitats, homes and niches, it's no surprise that we have a conservation problem larger than most. Here are the Report's "Primates In Peril." 9 Asians, 6 Madagascar species and 5 neo-tropicals head the list of most likely not to succeed! Vietnam, Indonesia, Brazil and China have more than one primate species threatened, endangered or simply being massacred. Many other countries can draw little sympathy for their protection measures either. Highlights seem like cuts from a horror movie in this scenario, but the pygmy tarsier is one of them. Tarsius pumilus in Sulawesi was not seen alive until 3 were found amazingly in a national park. While proving the efficiency of National Parks to a slight extent, the alarm was set for action in an area of human encroachment and armed conflicts. Madagascar is a political highlight all right! "Severely threatened" is the language used here for all of those unique lemurs. The Northern Sportive lemur, Leptilemur septentrionalis (sorry, but these Latin names are the only way to communicate real information) has 19 individuals left free, and very few in zoos. 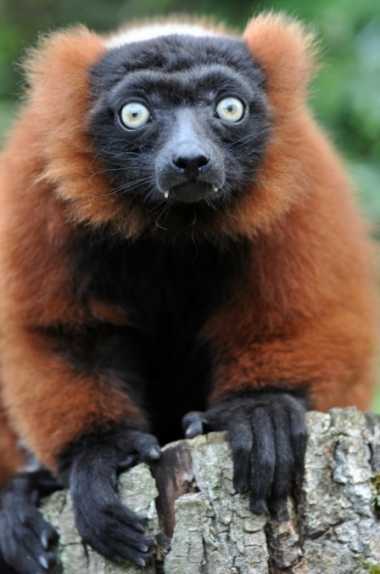 91% of lemur spp are almost extinct, many having passed away already. As Christoph Schwitzer of BCSF puts it, " Whilst we haven't lost any primate species yet during this century, some of them are in very dire straits. In particular the lemurs are now one of the world's most endangered groups of mammals, after more than three years of political crisis and a lack of effective enforcement in their home country, Madagascar. A similar crisis is happening in South-East Asia, where trade in wildlife is bringing many primates very close to extinction." Dr. Russell Mittermeier is the Chair of the IUCN SSC Primate Specialist Group and President of Conservation International. His opinions provide a valuable insight: "Amazingly, we continue to discover new species every year since 2000. What is more, primates are increasingly becoming a major ecotourism attraction, and primate-watching is growing in interest and serving as a key source of livelihood in many local communities living around protected areas in which these species occur." The gloomy assessment is slightly countered with some recovery stories.(eg. India's Lion-Tailed Macaque (Macaca silenus) and Madagascar's Greater Bamboo Lemur (Prolemur simus). We obviously try harder with vertebrates, mammals and especially primates. Amazingly, we fail even them!